Celaena Sardothien is a daredevil assassin with unrivalled fighting skills. 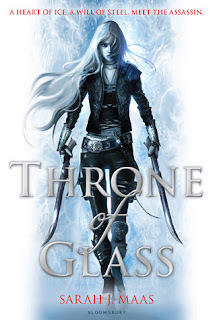 After a year’s hard labour in the salt mines of the kingdom of Adarlan, Celaena is offered her freedom on one condition—she must fight as handsome Prince Dorian’s champion in a contest sponsored by the king, facing the deadliest thieves and assassins in the land in a series of set-piece battles in the country’s stunning glass palace. But there is more at stake than even her life—for Celaena is destined for a remarkable future.. This book is one that is set to be huge. People are already raving about it online because it already has a huge fan base having already been self published online in a slightly different format in previous years by the author. The concept is epic. A teenage girl assassin fighting other assassins in a competition to become the King's champion and win her freedom from the salt mines in which she has been a slave labourer. Don't get me wrong I do think this series is going to be huge however I don't think it was necessarily the book for me. There were things about this book I liked and that kept me reading through to the end. I particularly loved the main character purely because she is such a strong young female role. She has the ability to kill a man twice her size with her bare hands. How is that not cool? I also liked getting to know her as the book went on and getting to know the softer side to her which is hidden at the start of the book. I also liked the political intrigue that is throughout the book. The historian in me got very excited hearing about all the political side behind the main storyline and I imagine there is a huge backstory to be explored here. However for me I found this book far too slow. I spend many a chapter hoping for something exciting to happen or kick off. I felt there was a lot of time put into getting to know the characters and the backstory but very little that pushed the story along until the very end. I'm hoping that this isn't a feature of the series as a whole but more just because the book is the first in a series and that by the time we get to book two things will have changed. All in all a series which I have my reservations about at the moment but still one I am looking forward to continuing on with as I think the series as a whole has epic potential. I'm really looking forwards to this one! Sounds like exactly my kind of thing. Although I have to say, while the US cover isn't mind blowing or anything, this UK cover is kind of...yeeeeeah. Kind of screams X-men to me?